In a Sylvester Stallone movie, you never need to ask: Is the plot plausible? Is the dialog coherent? Are the ideas fresh? The answers: of course not. But if you were to ask: Is this one entertaining? That answer would be: More than you might expect. It’s filled with non-stop craziness – and features a show-stealing performance by Antonio Banderas. As Stallone has done for the previous two episodes in this senior-citizens-with-ammo franchise, he’s gathered a few friends to smoke cigars, save the world, and blow stuff up. Emphasis on that last point: there’s a LOT of destruction in this movie. The storyline: bring the old team together, send them apart, put a young team together, bring back the old guys to rescue the young. The message: It may be “a young man’s game,” but age doesn’t mean much if you’ve got the right attitude. And access to high-powered assault rifles. 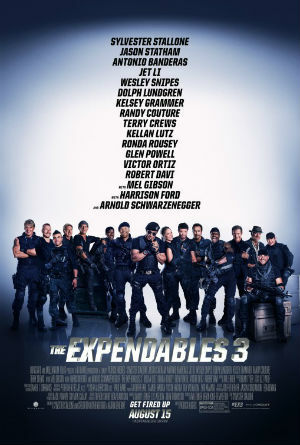 When the five main Expendables are together, their ages total almost three hundred years. Should men this old still be allowed and encouraged to do what they’re doing? Should they be given access to that much ammunition? The screen is most often filled with their rifles blazing; those scenes alternate with extreme close-ups of the guys, but mostly of Stallone, looking thoughtful, angry, pensive, calculating, concerned. Mel Gibson is a convincing villain, but by the third act, Banderas – as Galgo, a Mexican gymnastic hit-man – walks off with the movie. While buildings are exploding in the background, you’ll laugh out loud at his antics. There’s nothing here you haven’t seen before – but that’s really too much to expect. Stallone delivers exactly what he promises: popcorn-munching fun. With a bang.